The Greater Toluca Lake Neighborhood Council is an advisory body made up of elected neighbors and stakeholders who advocate for community needs with City Hall. Funded by taxpayer dollars, the GTLNC can only be elected by the members of the community. 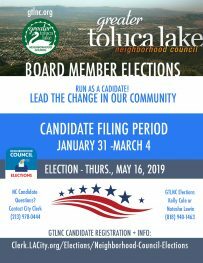 Choose the representatives who will help Toluca Lake thrive by voting in the 2019 GTLNC election on May 16 from 6 to 8 p.m. at Harmony Church, 4301 Cahuenga Blvd. For more information, visit gtlnc.org. Save the date for the Downtown Burbank Arts Festival! This year's festival will be held on May 18–19 from 11 a.m. to 7 p.m. on San Fernando Boulevard (from Burbank Town Center to the Holiday Inn). More details to come! Brighton Hall Presents the Young Performer Expo Saturday, May 18th, 1-4pm The Young Performer Expo helps children with talent in art and entertainment find resources that will guide them towards success. You will be connected with industry professionals and discover new learning opportunities that focus on career advancement and artistic development.